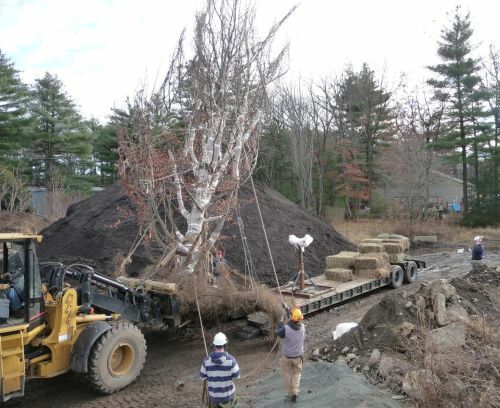 This year’s New England Grows featured a talk by Jim Flott, who discussed the bare-root transplanting of large trees. Jim talked about root-washing, something he has studied, practiced, and taught, on his own and with the late Bonnie Appleton of Virginia Tech. He spoke about the history of bare-root transplanting — until the middle of the 1900s bare-rooting was the primary way to transplant trees — and about bare-rooting with air tools. It was a great presentation; this abstract by Flott and Appleton covers a lot of the territory Jim discussed, and it’s worth a read. 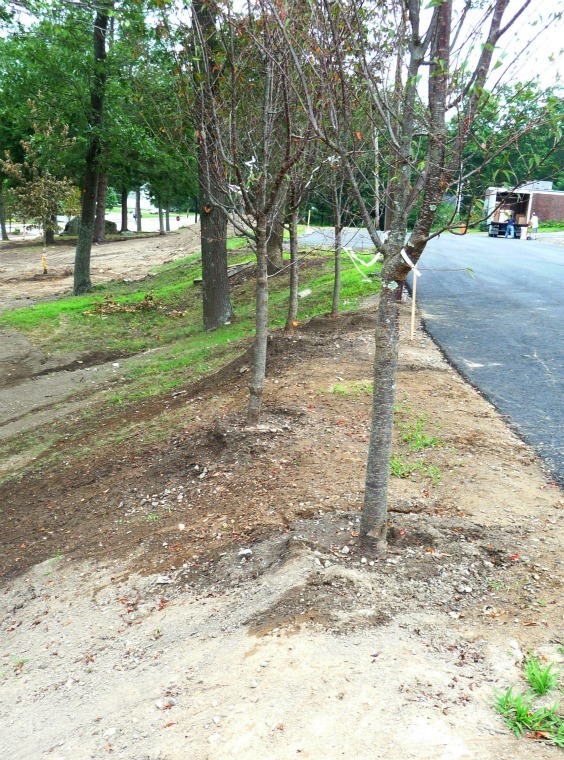 Bare-root transplant with air tools — 12″ caliper London Plane tree, moved in late July 2009 in Wellesley, MA. After Jim’s talk in one of the large auditoriums, he moved to a smaller room for an ‘Speaker Unplugged’ session, where people could ask him questions and exchange information. 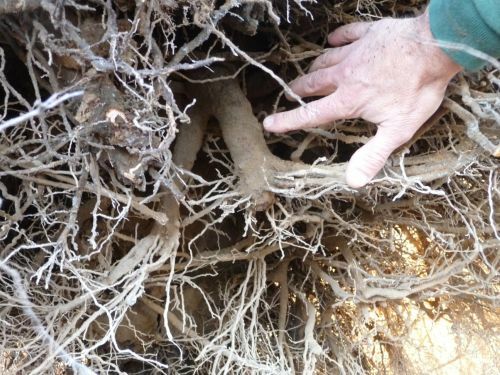 As had happened at New England Grows three years ago, when Matt Foti discussed bare-root transplanting with air tools, someone asked about the effects of bare-root transplanting on a tree’s taproot. How does bare-root transplant affect a taprooted tree? The answer, both from Jim and from Matt, is that taproots are rarely an issue. A taproot typically forms when a seed germinates; the baby taproot emerges first from the seed, growing down and anchoring the seed in the soil. Next, the cotyledon shoot emerges and grows upward. As the cotyledon starts to photosynthesize, root hairs branch out from the taproot, and the root volume grows and spreads. The depth of roots is determined in part by available moisture and in part by soil type. Typically, organic soils — which hold water and allow good cation exchange — rest at the top of the soil profile; mineral soils underlie the organic horizons, and are much less hospitable to roots. Here in New England soils may be quite thin, and are often underlain with rock. So taproots here will serve that useful anchoring function early in a tree’s life, but soil conditions and the plant’s own tendencies will promote the outward, rather than the downward growth of a tree. In fact, the overall growth of tree roots tends to be outward, rather than down; the old image of a root mass volume and form mirroring a tree’s crown volume and form has been proven false. 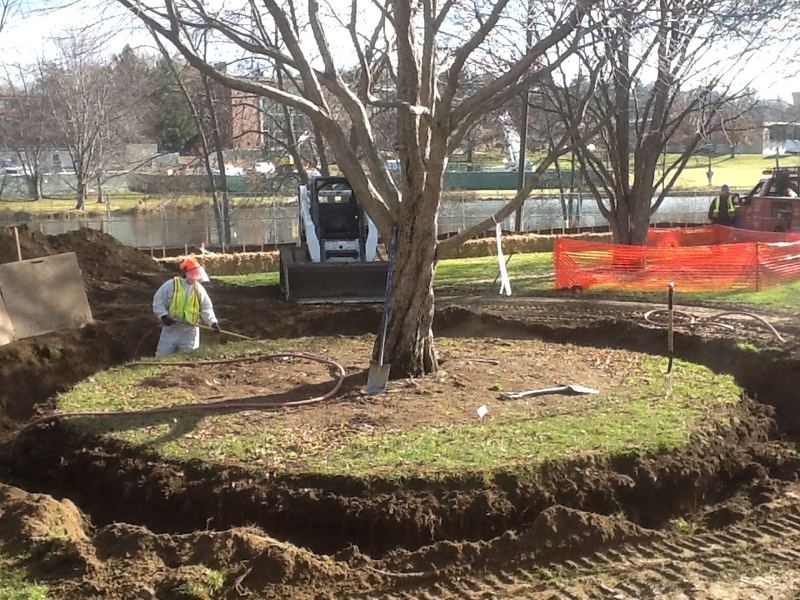 We know that trees tend to develop their roots in the top 18″ of soil; the larger the tree, the deeper that zone may go, but typically it extends no more than 3 or 4 feet below grade. Some thick roots on very large trees may extend vertically down in this zone, if soil conditions permit, but many more run horizontally away from the tree’s trunk. The anchoring function of that original taproot, if it remains, is replaced by the anchoring provided by a much broader and more extensive mass of roots growing out and (to a much less extent) down. It’s helpful to keep in mind another factor when thinking about taproots and transplanting trees. More often than not, a large tree being transplanted was planted out years earlier as a B&B plant, or possibly moved into place with a tree spade. Both methods would have cut any taproot in the initial planting. When the end of a root is cut, the tree tends to send shoots out from just above the cut end. In a vertically oriented root, the new shoots are apt to extend horizontally from the cut end, and feeder roots would similarly extend out horizontally. 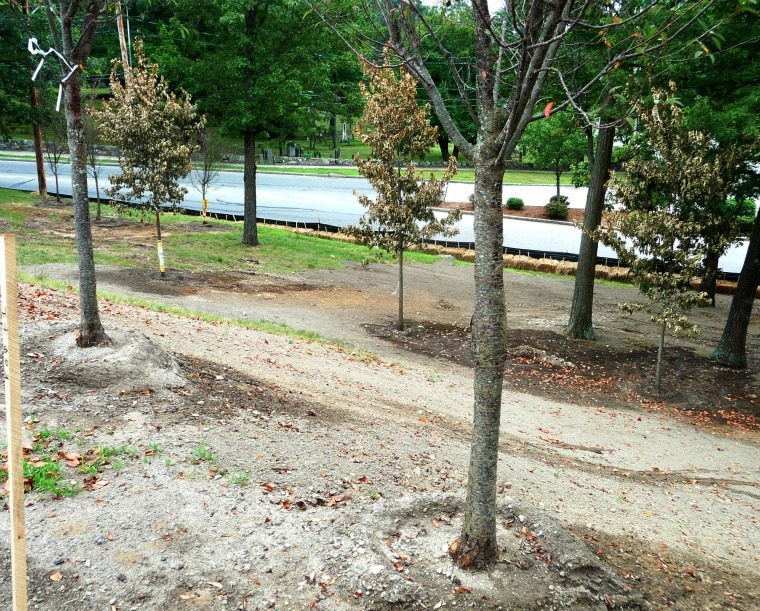 The situation may well be different for a tree that has grown from seed in one place, that someone now wants to transplant bare root, but for most landscape trees the taproot issue is moot — whatever taproot may have existed when the tree seed germinated has already been cut, and the tree has adjusted for its loss. 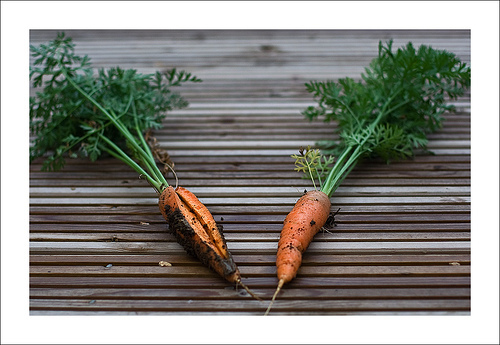 A carrot grows downward, with rootlets out to the side and foliage above ground. A tree is not a carrot. Photo by obenson in Flickr. This beech tree was moved last fall, having been transplanted once about 20 years ago. See how the root mass extends far out horizontally, with a relatively shallow depth. This is one of the thickest roots extending vertically from the beech’s trunk. This root was cut in the earlier (20 years previous) transplant; note the resultant root growth just above the cut. 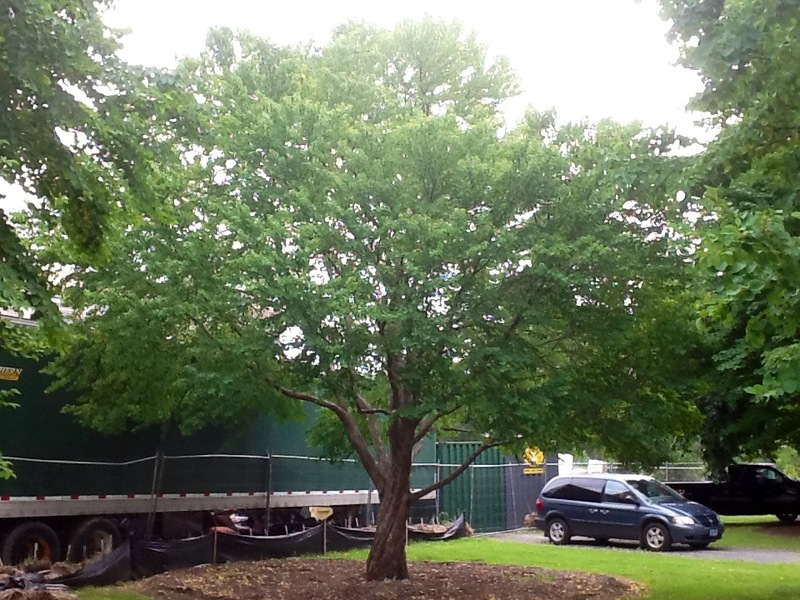 Last fall Matt Foti‘s excellent crew moved a mature Katsura tree (Cercidiphyllum japonicum) on the UMass campus in Amherst. 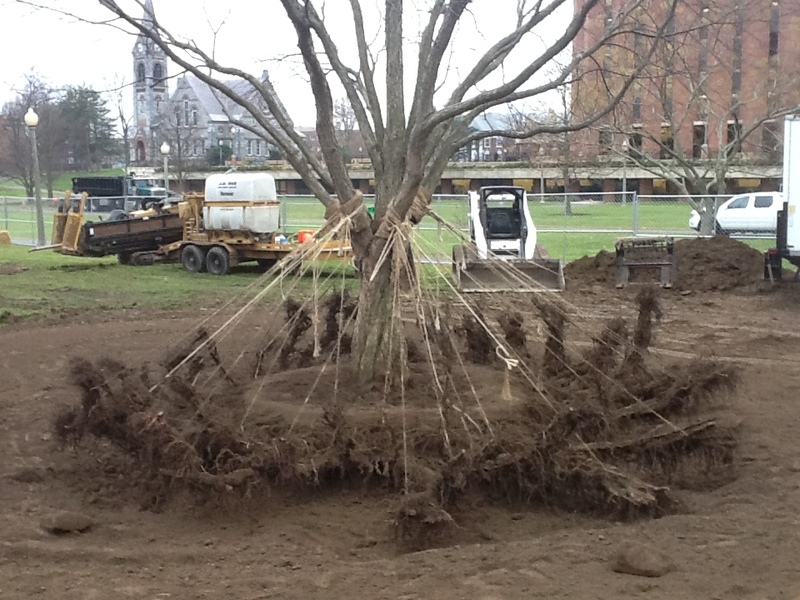 Jim Flott showed one photo of the tree in his New England Grows presentation last week, to illustrate the breadth of a root mass; take a look here to see what it looked like during and after the soil blowoff. Notice the trench dug around the entire root mass. 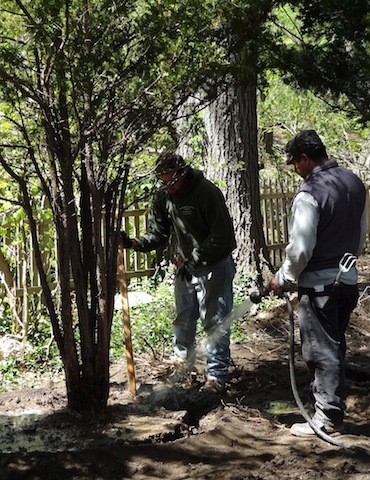 Typically, the crew uses a line tied to the trunk to swing and mark the edge of trench at the tree’s dripline. If really significant roots appear once the first buckets of soil have been dug, the crew can decide to shift the trench edge outward to save more roots in the blowoff. Alternatively, if no roots are found that far out from the trunk, the excavator can dig closer in to the trunk until roots appear, and the trench placed at that diameter out from the trunk. 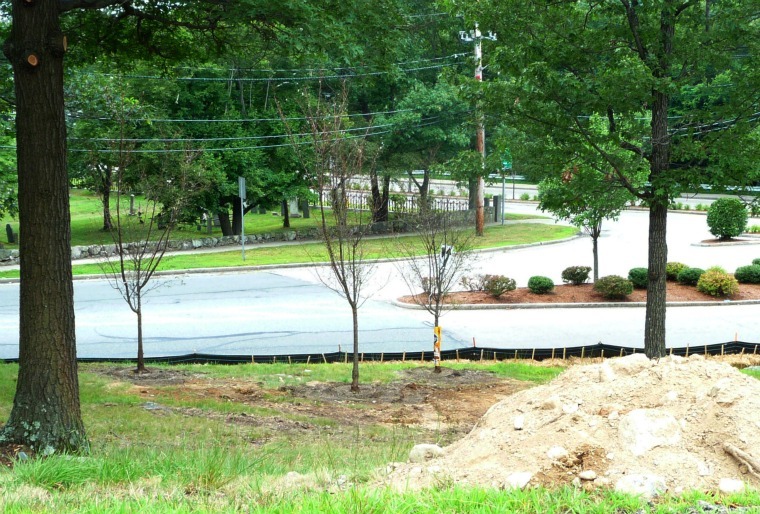 Plywood is visible to the left of the photo; soil is blown into the trench for removal, but plenty of soil and dust fly around, and the plywood barriers help contain it, and keep the surrounding site cleaner. The soil pile behind the plywood is what has been excavated to form the trench. According to Matt, this tree is 20″ dbh, with a 22-24′ wide root mass. The crew blew it off in one day, and moved it about 2,000′ away the next day. 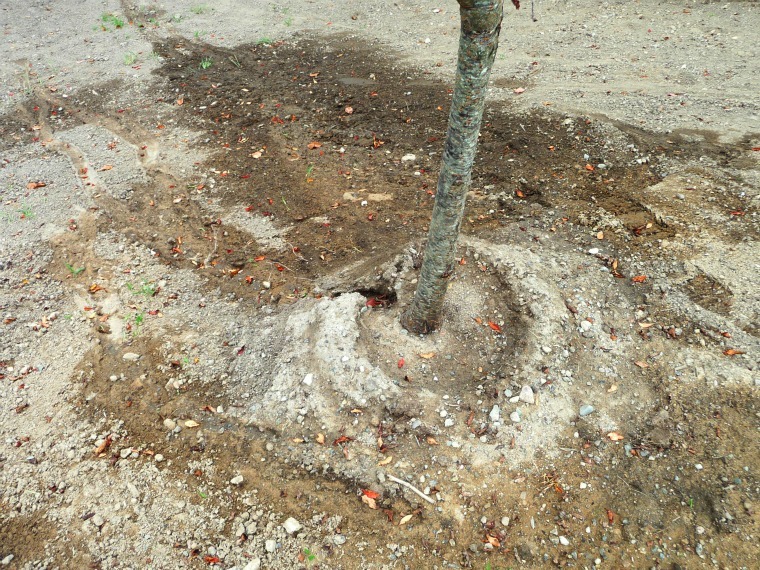 One of the benefits of air tool work like this is the fact that roots become visible, and it becomes clear how a tree grows below the soil surface. The roots here obviously cover a huge area, and their density and branching suggest resilience and vitality. 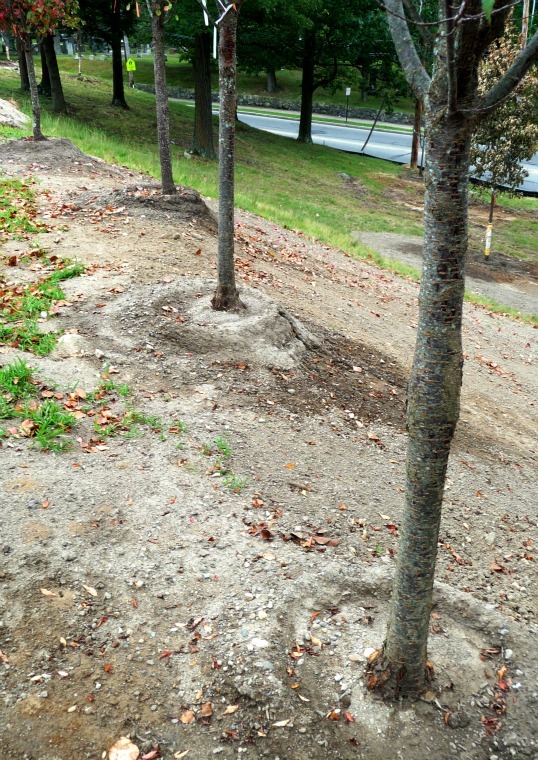 Notice how much soil remains around the base of the tree. Leaving a slug of soil makes it easier to place the tree level in its new location, at the correct depth. The crew usually blows soil first from the root tips, and works back toward the trunk, always blowing soil toward the trench. The circular track around the tree’s trunk was made by the crew toward the end of the blowout, as they worked their way around the tree. Pigtails of roots are held off the ground with lines tied back to tree branches well-padded with burlap. Katsura en route to its new home on the UMass campus. Interesting to note how dense and finely branched the tree’s crown is, especially in light of how dense and finely branched the root system is. Stay tuned for more photos of this tree in the next few months, when we get some followup shots after it has leafed out. 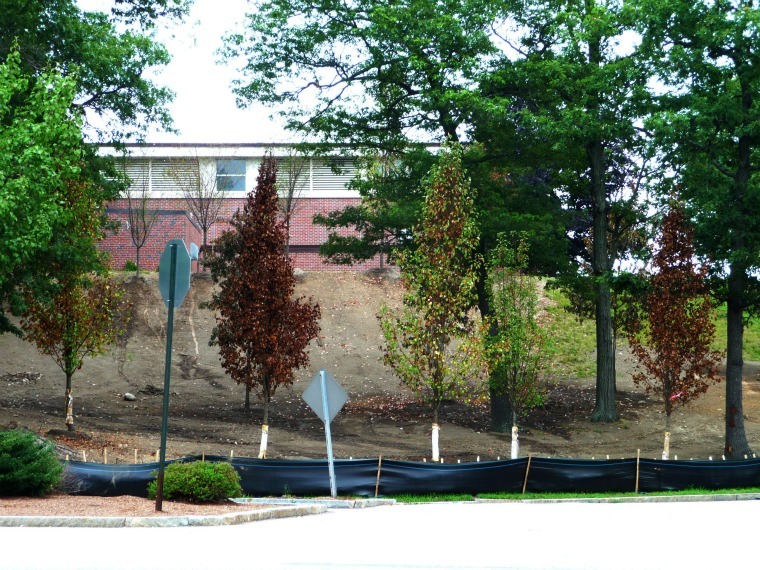 Moved by: Matthew R. Foti Landscape & Tree Service, Inc.
Elm trees are known for their toughness in urban conditions; it’s why so many were planted in the American landscape. For speed of growth, beauty of form, and wholehearted commitment to growing in all sorts of conditions, almost nothing beats Ulmus americana. The elm’s Achille’s Heel, of course, is Dutch Elm Disease, which decimated the population of them through the twentieth century. For the last half of the twentieth century, it was quite unusual to see American elms planted anywhere; they almost entirely disappeared from the market. It wasn’t impossible to find them, though, and scientists and a few growers continued to work on developing disease-resistant strains of this majestic tree. 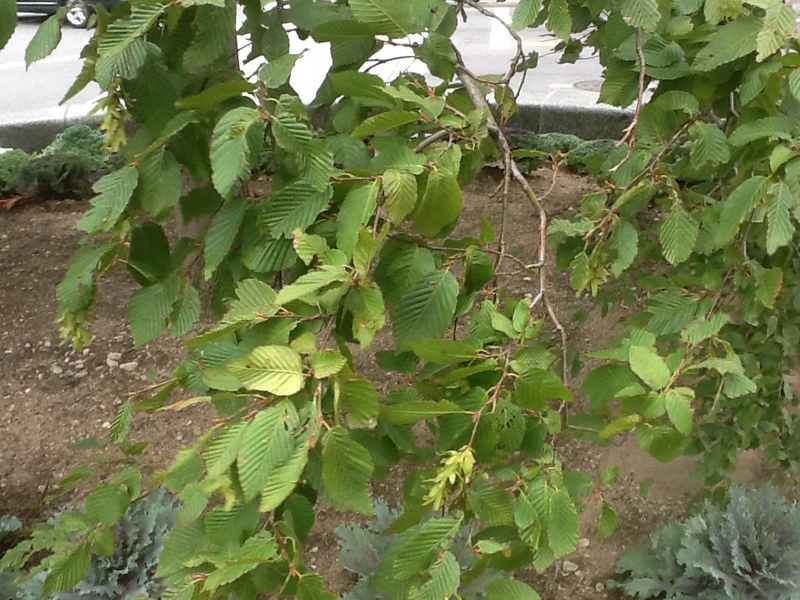 The Elm Research Institute grew and distributed clones of elms it believed showed resistance, and in the 1990s Dr. Denny Townsend, a geneticist with the National Arboretum, released two of the first DED-resistant cultivars of American elm, called ‘New Harmony’ and ‘Valley Forge’. Bit by bit the American elm began to reappear in the landscape. I was part of the design team for the streetscape restoration of Boston’s downtown area during the Big Dig design and construction phases. 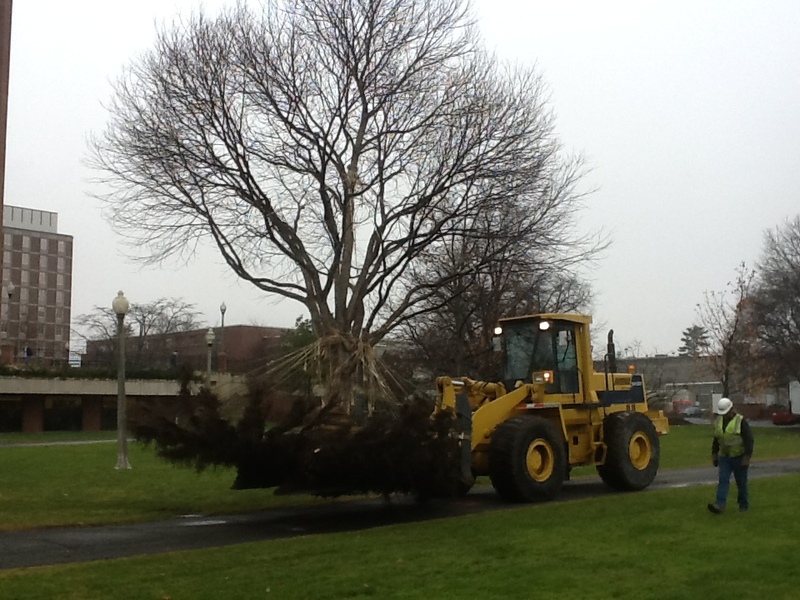 We selected the National Arboretum elm cultivars, among a range of trees, to help fill out the planting palette for what became the Rose Kennedy Greenway. So far, the trees have been doing swimmingly. 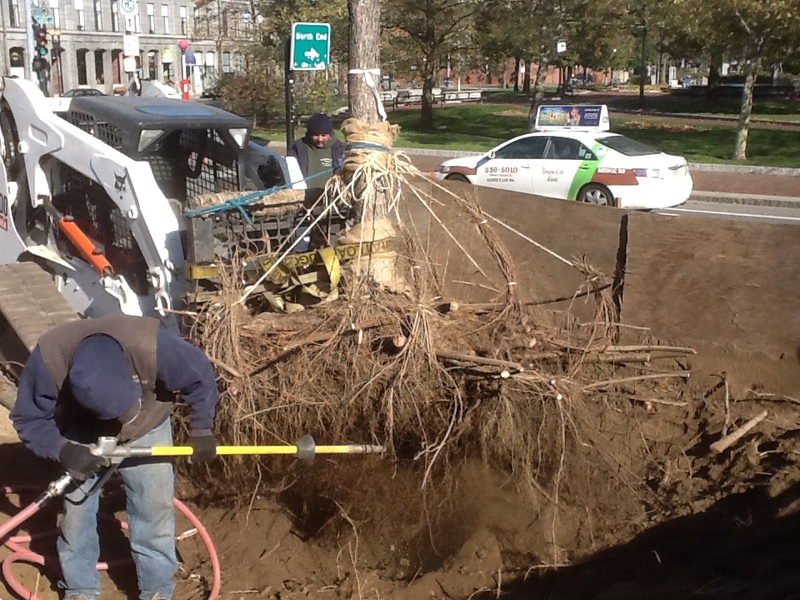 Last week Matt Foti’s crew spent a few days on the Greenway moving a collection of trees bare root from one of the parcels near Quincy Market. The Rose Kennedy Greenway Conservancy will be building a permanent carousel on that parcel, and they wanted to save and reuse the trees that had been growing where the carousel will be placed. Matt called to tell me about the work, which involved moving some red maples and some American elms that had been in the ground for the last 6-7 years. The red maples, about 6″ in diameter, moved quite easily; their roots had readily broken out of the original root balls and grown nicely out into the planting medium. Blowing them out was a simple process. Tremendous root mass on an elm that had been planted only 6-7 years earlier. 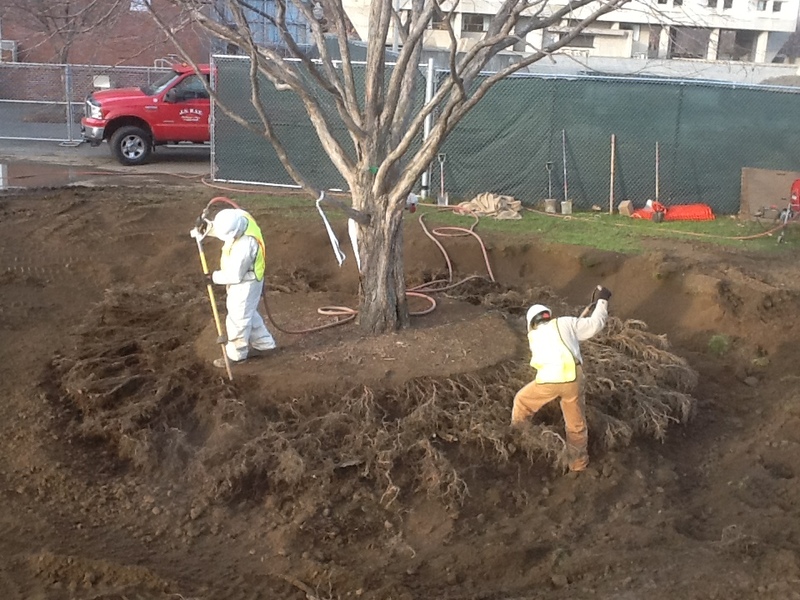 One elm getting lifted out of its planting hole. Sinker roots had to be blown off; though the tunnel top is three feet below the surface, it appears that the roots on this tree had grown down to the concrete surface. Note the clean cuts on roots that had to be severed. 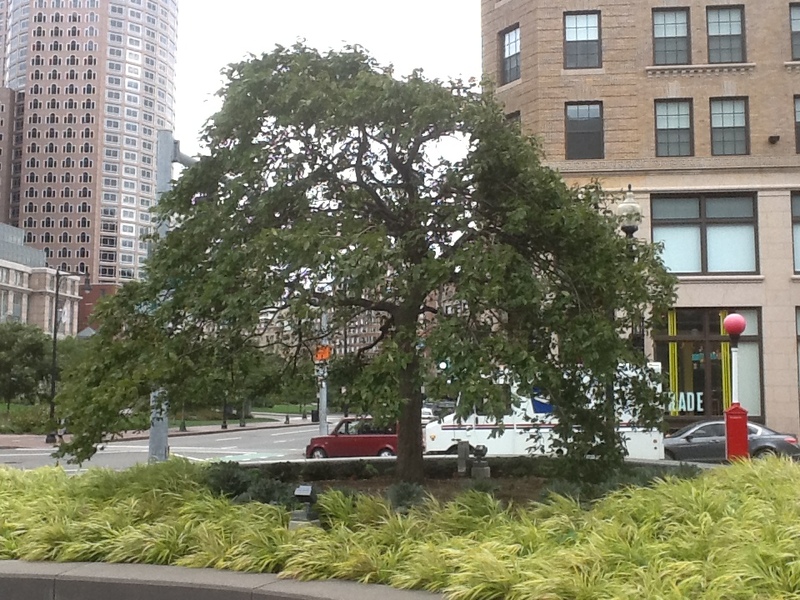 Last spring I posted photos of a lovely little weeping hornbeam that the Foti crew had transplanted bare-root in downtown Boston a month earlier. 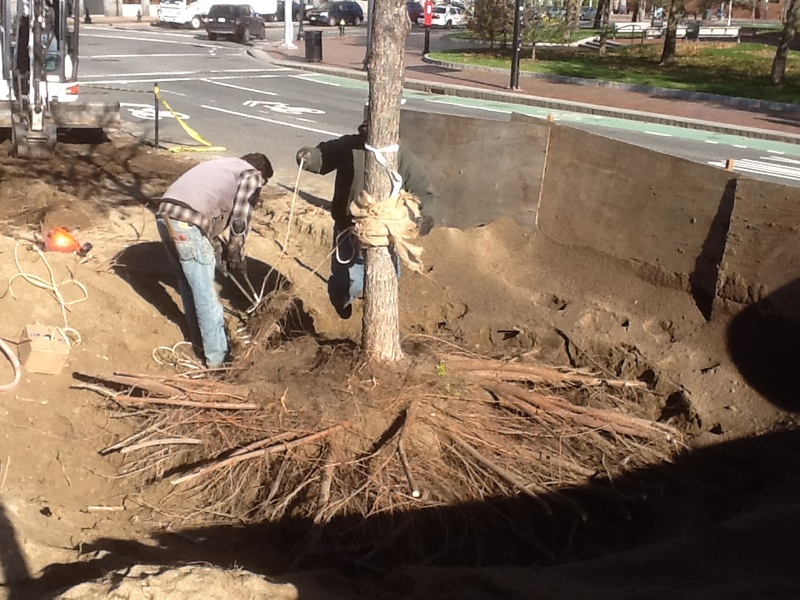 Matt Foti just sent me a couple of update photos, taken when his guys had been down on the Rose Kennedy Greenway to move a collection of trees from one of the park parcels near Quincy Market (a couple of photos from that project will show up in my next post). Nice dense foliage on the transplanted hornbeam. This tree apparently didn’t miss a beat when it was moved.